A perfect storm of food scarcity, global warming, rocketing oil prices and the world population explosion is plunging humanity into the biggest crisis of the 21st century by pushing up food prices and spreading hunger and poverty from rural areas into cities.
. . . The increasing scarcity of food is the biggest crisis looming for the world. As well as being rural, the profile of the new hungry poor is also urban, which is new. There is food available in the markets and shops – it’s just that these people can’t afford to buy it. 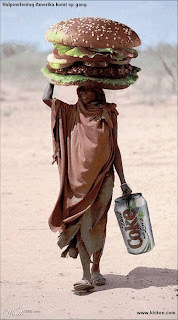 This is the new face of hunger.” The food shortages will also affect western industrialised nations. (The World Bank) points out that global food prices have risen by 75% since 2000, while wheat prices have increased by 200%. The cost of other staples such as rice and soya bean have also hit record highs, while corn is at its most expensive in 12 years. The increasing cost of grains is also pushing up the price of meat, poultry, eggs and dairy products. And there is every likelihood prices will continue their relentless rise, according to expert predictions by the UN and developed countries. High prices have already prompted a string of food protests around the world . . . If prices keep rising, more and more people around the globe will be unable to afford the food they need to stay alive, and without help they will become desperate. More food riots will flare up, governments will totter and millions could die. The rise in global temperatures caused by pollution is also beginning to disrupt food production in many countries. According to the UN, an area of fertile soil the size of Ukraine is lost every year because of drought, deforestation and climate instability. The UN Intergovernmental Panel on Climate Change has predicted that, over the next 100 years, a one-metre rise in sea levels would flood almost a third of the world’s crop-growing land. 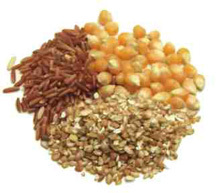 The world’s grain stocks are at their lowest for 30 years . . .
Another key driver is the soaring cost of oil . . .
. . . oil makes crop fertilisers more expensive . . .
. . . fertiliser prices have risen 150% in the past five years. The global drive for a new green fuel to power cars, lorries and planes is worsening world food shortages and threatening to make billions go hungry. 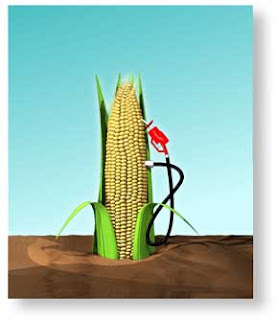 The biofuels surge makes things worse by adding high demand on top of already high prices and low stocks . . . Ethanol and biodiesel produced in the US and European Union don’t appear to be delivering on green promises either, making them very controversial. It’s very hard to imagine how we can see the world growing enough crops to produce renewable energy and at the same time meet the enormous demand for food. The idea that you cut down rainforest to actually grow biofuels seems profoundly stupid . . .
You could feed a person for a whole year from the grain that produces just one tank of fuel for a sports utility vehicle (SUV). The US grows 60% of the world’s export crop of maize. At present one-sixth of the US grain harvest is going into the tanks of cars. So far the US has no serious programs in place to increase fuel efficiency or invest in public or alternative forms of transportation. And the US is talking about tripling the use of grains for biofuel. This isn’t just a problem for the rest of the world. It will soon be a huge problem for the US with its suburban sprawl. With fuel prices going up, will people be able to afford to get to work? How much will they have to give up eating in order to drive? At the same time this is happening, the developed countries are still keen to ram trade deals down the throats of the developing world that are highly destructive to the support and development of local agriculture. Growing food locally, and eating food grown locally, wherever people can do this, is the best way to fight back against these global shortages. Most current research indicates this is the healthiest way to eat as well. But when local farmers in the developing world are being undersold at home by heavily subsidized crops from the developed world, it is not possible to support and sustain local agriculture. Food import surges following “liberalization” of trade are devastating farmers and agricultural production in the developing world. GENEVA, Mar 7 (IPS) – Food import surges have had devastating consequences for the rural poor and local economies in Africa. Such surges have taken place with alarming frequency in the past decade or two. Import surges follow in the wake of liberalisation of trade. Liberalisation brings into play multiple factors that are often beyond the control of importing countries. These include firstly the domestic support and dumping policies of exporting countries. The products in which import surges occur most frequently are also the products which receive the highest subsidies from the EU and the U.S.
Other factors are: currency fluctuations in third countries; dumping of food aid when it is not required; and policy whims of exporting countries, such as destocking exercises which cause surges on the world market. In Ghana rice imports increased from 250,000 tonnes in 1998 to 415,150 tonnes in 2003. Domestic rice, which had accounted for 43 percent of the domestic market in 2000, captured only 29 percent of the domestic market in 2003. In all, 66 percent of rice producers recorded negative returns, leading to loss of employment. Tomato paste imports from the EU increased by a staggering 650 percent from 3,300 tons in 1998 to 24,740 tons in 2003. Farmers lost 40 percent of the share of the domestic market and prices were extremely depressed. When Ghana reduced its rice tariffs from 100 to 20 percent as a result of the structural adjustment policies enforced by the World Bank, rice imports doubled. Poultry imports have surged in Ghana, 300% in Cameroon, and 650% in Cote d’Ivoire in this 21st century. There are countless more such cases which FAO and others have documented: dairy, maize and sugar in Kenya; rice and vegetable oils in Cameroon; onions and rice in the Philippines; rice and soy in Indonesia; maize, sugar and milk in Malawi; rice, dairy and maize in Tanzania; poultry in Jamaica; oilseeds in India; onions and potatoes in Sri Lanka; tomato paste in Senegal; soy and cotton in Mexico; rice and poultry in the Gambia; rice in Haiti and so forth. These cases, documented by the FAO, should lead negotiators to exercise caution in the current Doha talks on the special safeguard mechanism. Import surges are already happening, even before yet another round of liberalisation as is under negotiation in the current Doha Round. Effective measures should be made available to developing countries if food security and rural livelihoods are to be given priority. Like the Millennium bug, the most dreaded 31st December 2007 deadline ‘fever’ for the conclusion and possible signing of the EPAs has come and gone without the expected casualties.
. . . thumbs up for the West African negotiators, especially for the ECOWAS Commission. Credit must essentially be given to the Nigerian government and to the West African civil society that kept mounting irresistible mobilization and pressure on the regional institutions to look towards no other direction but to a development friendly EPA. At least, and essentially for our EU colleagues, the lesson may not be forgotten in a moment; and the lesson is that ‘times have changed’. It is no longer a Master-servant (colonial) relationship where the under-dog could always easily be cowed into swallowing hook and sinker all demands and claims that are placed on the table. Mr. Ukaoha seems optimistic that the EU and ECOWAS have an opportunity to move forward in a fashion that actually is development friendly and mutually beneficial. I hope he may be right. There are huge economic storms brewing, and environmental storms with profound economic effects headed our way.